D.C. 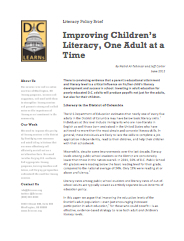 LEARNs has just published a policy brief that reviews the research on the influence that a parent’s educational attainment and literacy level has on his/her child’s literacy development and success in school. The research review was conducted by our spring policy intern, Nahid Al-Tehmazi, and the paper itself was co-written by Nahid and myself. You can view/download the paper here.